Yoga has become one of the most popular forms of exercise in the country. You’d be hard-pressed to find a gym that doesn’t offer at least one yoga class, and here in New York City people walk around with rolled-up yoga mats slung from their shoulders as casually as they’d carry a purse or briefcase. Advocates of yoga say that it improves physical strength and flexibility while providing a sense of calm that too few of us enjoy in our fast-paced lives. But did you know that numerous studies have demonstrated that yoga can be beneficial to youngsters, too? Youth yoga programs have been shown to improve student self-esteem and self-image, behavior, and even academic performance! 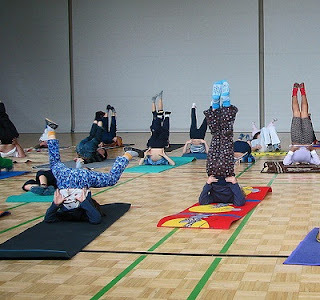 Your blogger was recently interviewed for a blog post for YoGanesh, a wonderful yoga studio just blocks from The Yellin Center, about the many ways yoga can benefit kids. We noted that physical, emotional, and behavioral factors can play huge roles in academic well-being and that research shows that practicing yoga can have amazingly wide-reaching benefits when it comes to improving children’s behavior, mental/emotional health, and cognitive function. You can see the full interview and the references for current research when you visit the blog. And please take a moment to visit their website to learn more about yoga and young people. Namaste!